Yesterday, State Representative Kelly Townsend revealed a dark side of Senate President Andy Biggs. During a guest opinion on Sunday Square Off, the two-term legislator from Arizona Legislative District 16 disclosed that Biggs’ leadership style was to punish lawmakers who refused to get in line with his political agenda and leadership. Townsend tied the comments to her 2015 House vote in which the legislature voted to limit Temporary Aid to Needy Families (TANF) – a vote she regrets. Townsend herself, is a widow with children representing a district adjacent to the district represented by Biggs. “It is a culture many of us are trying to change,” Townsend said. Townsend also accused Biggs of refusing to communicate with her and preventing bills she sponsored from progressing through the legislature for two years. Townsend said she believed Biggs’ actions were payback because she gave a radio interview in support of a bill Biggs opposed in 2013. This revelation draws into question Biggs’ temperament and leadership style as the potential nominee for Arizona’s 5th Congressional District. Biggs’ spokesman, Adam Deguire, the former Chief of Staff to Congressman Matt Salmon who is now part of the political hand-off arrangement between Salmon and Biggs, acknowledged Biggs’ unpopularity with the mainstream media on issues such as TANF. Senator Andy Biggs has not made an appearance on Sunday Square Off since February 27, 2011 and failed to show up last week for a debate on KAET’s Horizon. Conservatives across the state should rejoice — we finally have a conservative governor who will do what’s always right, and not what’s always popular. Arizona Gov. Doug Ducey said Thursday that he won’t seek to reverse cuts to the state’s welfare program made when the state appeared to be facing a major budget crunch, despite a dramatic turnaround in finances. DES is the state’s social welfare agency and oversees welfare, unemployment, child support services and many other programs. Ducey’s first-year budget limited Arizona families to no more than one year of cash welfare benefits in their lifetime, the shortest period in the nation. The state was facing a possible $1 billion deficit when the law passed in the spring but now expects a $650 million surplus next year. The general relief welfare program provides up to $278 a month for a family of three and was limited to two years of eligibility. The cuts approved by the GOP-led Legislature and signed into law by Ducey will lead to 1,600 families being thrown off the state’s welfare rolls starting July 1, 2016. There are exemptions in the new law for some people, including those with disabilities are who are homeless. The plan is expected to save $4 million in spending in the 2017 budget year and will use the money instead to help fund the state’s child safety agency. The money is actually federal funds provided to Arizona in a block grant for social welfare programs. Limiting general relief eligibility allows Arizona to use the money in other ways. Democrats complained bitterly about the cuts when the budget that included the cuts was enacted in March. 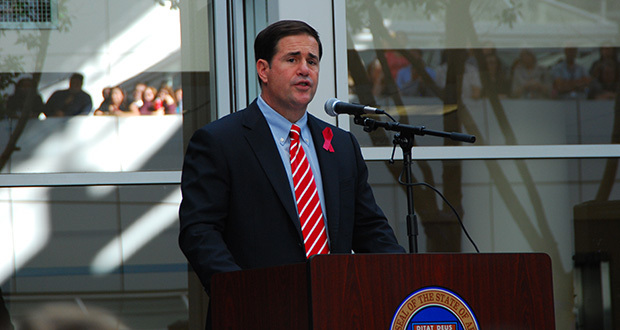 Ducey has defended the cuts, saying they are designed to encourage welfare recipients to find a job. On Thursday, he repeated that intent. The cuts bringing Arizona’s lifetime welfare benefits to one year are the third- time limit cut in five years. They were cut from five years to three in 2010 and to two years in 2011. Like Daniel Hannan, Member of European Parliament Nigel Farage is a plain-spoken Brit who sees what is happening across Europe and cannot remain silent. The video below, uploaded June 13, is titled “The Genius of Mutual Indebtedness.” It is fast going viral. How will the EU countries respond to Farage? Will they finally begin pulling back on their socialist welfare state? Or will they perhaps re-lower the retirement age as the socialist president of France, François Hollande, just did? Or perhaps they will look for some convenient scapegoats? Given our own debt and over-spending problems in the US, how much sympathy should we have for our EU friends who, protected for 60 years by an American-taxpayer-funded military umbrella, have fully embraced the socialist welfare state as their preferred political model? For more on the EU debt crisis, see the video below in which Farage engages in dialog with Ken Livingstone, former Mayor of London. The discussion is primarily about EU debt. Livingstone is known to Americans largely for his open policies on immigration that have led some to call London “Londonistan”. Put “Nigel Farage” into a YouTube search box, and you will find many more occasions where Mr. Farage speaks out against the EU both in its concept and its execution. Why should we in America care about all this? As I wrote in a post last October, “Europe is living in our future and we don’t want to go there.” Consider where Agenda 21 advocates are trying to take America and picture a global version of the EU enveloping and smothering our country. If well-intentioned, kind-hearted Americans really want to help Europe in this looming debacle, the best thing we can do is (1) send the Obama entourage back to Chicago and the faculty lounges of the Leftist universities from whence they came, and (2) restore free markets, Constitutionally limited government, and fiscal/personal responsibility. The resulting boom in America will be the example European and other countries need to set things right.